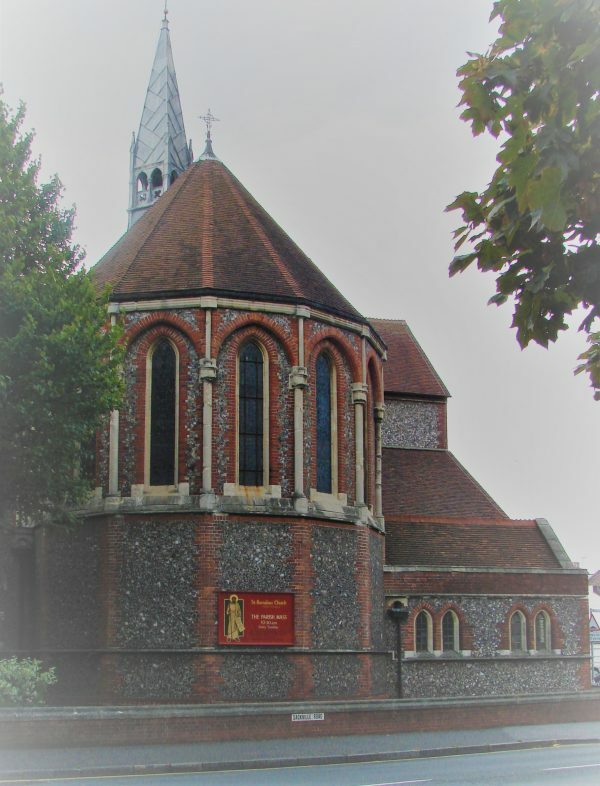 J L Pearson designed some of the most handsome and expensive parish churches in England and of these Hove possesses one – All Saints. His talent for massing and purity of line was, however, equally apparent in his inexpensive churches. St Barnabas was designed in 1881-83 (ICBS) for the same man as All Saints, the Rev Thomas Peacey, in the extensive poor area around the station, where development started in the 1860s. It cost £9105 (KD 1899) and is built of flint with mostly brick dressings on a cruciform plan with a leaded flèche over the crossing. The spacious interior is faced with brick, now whitewashed; even the arches of the arcades are brick, though on three sides the piers have foliage capitals, the carving of which was not completed until 1923 (EH). 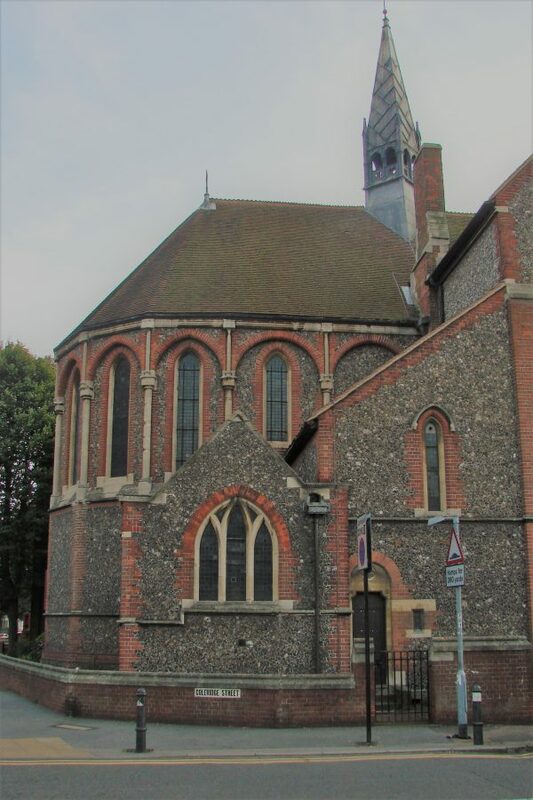 Pearson planned a tower at the south west corner and without it the east end of the church is the show side. The design is one of striking economy, consisting of a polygonal apse with tall lancets contained in arches inside and out. Though shafted, these insufficiently prominent to compromise the general restraint. The apse contrasts with the lower square-ended south chapel, which is entered through a double arch from the transept; a similar one in the north transept opens into the organ chamber. 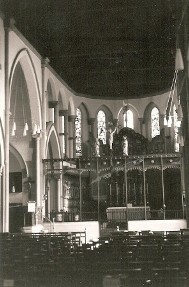 There is no chancel arch and the main roofs are joined to the arcades by shafts, rising the full height of the church. However, the aisles have plain, groined vaults. These have been whitened, probably in 1928 when the walls, originally plain brick, are known to have been done (GRI). Font: Big, showy square bowl of alabaster, designed by Pearson in 1885 (BE(E) p242). 1. (Apse and south chapel windows) Clayton and Bell, 1887-95. Pearson took an interest in their design (Quiney p268). 2. (South transept, east window) A Seward and Co, 1898 (B 75 (1898) p512). 3. (South aisle, west window) Jones and Willis, c1909 (signed). 4. (West and both aisles, first to third windows) Ward and Hughes, designed by T F Curtis, 1921-24 (Clarke papers). Pulpit: Oak. Designed by Pearson, 1884 (Quiney p257). Reredos: An oak triptych by G F Bodley, 1906 (WSRO Ep/II/27/163). The surrounding panelling including the statues of saints was carved by Captain L Wyatt in 1909 (BE(E) ibid), though it is general keeping with Bodley’s triptych. Rood-screen: Iron and thin in appearance, it is said to be by W B Reynolds, 1913 (BE(E) ibid). Stalls: Also by Pearson, 1893 (Quiney ibid).